TABLES. Year: 2015 Media: Sculpture. Materials: Emulsion paint on wood and LED tube light. TABLES. Year: 2015. Media: Sculpture. Materials: Emulsion paint on wood and LED tube light. HIGH VOLTAGE. Year: 2015. Media:Painting. SIze: 74x67cm. Medium: Oil on Board. HIGHS/LOWS. Year: 2015. Media:Painting. SIze: 48x65cm. Medium: Oil on Board. MINIMAL MOODS. Year: 2015. Media:Painting. SIze: 80x50cm. Medium: Oil on Board. SUITABLE SHELF. Year: 2015. Media:Painting. SIze: 40x75cm. Medium: Oil on Board. MINIMAL MOODS. SUITABLE SHELF. HIGHS/LOWS. Installation view, 2015. 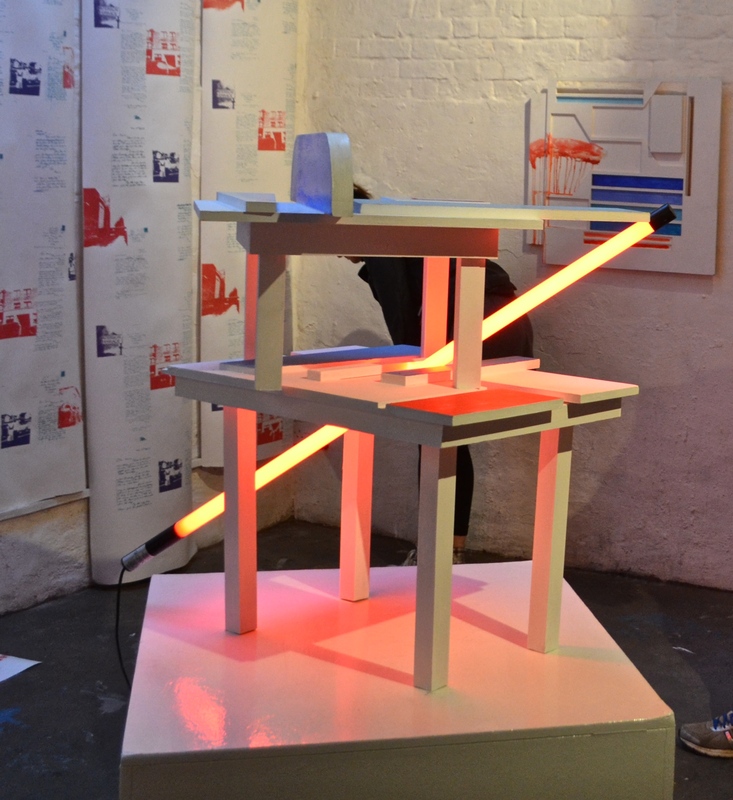 The Ideal Homeshow, hARTs Lane Studios, 2015: The five female artists have collaborated to turn the experimental project space into a home made entirely out of their art. Each artist contributes to constructing the space with art influenced by her own interpretation of what it means to make a home. The exhibited pieces resemble everyday household objects, from wallpaper to furniture, that are transformed by the artists and question what really makes a home. For this project I created functional art objects inspired by common household fixtures and furniture. The pieces predominantly are made from wood off cuts to create 3D collages; pre-formed shapes that serve no purpose, which are then reconstituted into new functional objects.